The etiology and pathogenesis of airway-centered idiopathic fibrosis (ACIF) remain to be determined. Some have speculated that this condition may result from exposure to various noxious environmental agents. Although the patients described in the literature were either current smokers or ex-smokers with modest degrees of cigarette consumption, smoking is not believed to have a significant contribution in its pathogenesis. Churg et al failed to find any clinical, serologic, or histologic evidence of hypersensitivity pneumonitis in their series of 12 patients. Instead, they documented a history of exposure to various environmental substances such as wood smoke and chalk dust in their cohort of patients; however, their role in etiopathogenesis has not been established. Overall, airway-centered idiopathic fibrosis may represent a pattern of lung injury in response to environmental agents that are currently not known. In a retrospective analysis (1982-1988) of lung biopsies obtained from 49 patients with clinical, radiologic, and histopathologic diagnosis of idiopathic pulmonary fibrosis, 12 patients had a histologic pattern of centrilobular fibrosis (6 men, 6 women; mean age 58.4 years). An interesting finding was the presence of foreign bodies in the bronchiolar lumina (41% cases) and extensive necrosis of bronchiolar epithelium leading to regeneration (91% cases), a feature not described by other authors. Based on these findings, the authors hypothesized that fibrosis as well as necrotic changes in the bronchiolar epithelium could have been caused by chronic aspiration of gastric contents. The pattern described in this report appears to be different from that of airway-centered idiopathic fibrosis in which bronchiolocentric fibrosis is the predominant feature with intact bronchiolar epithelium without any necrosis or regeneration. Moreover, the study did not include data on prognosis for comparison with the previous studies. Fukuoka et al described peribronchiolar metaplasia (PBM) as the only histologic finding in surgical biopsies of 15 patients with clinical history of interstitial lung disease. In this study, PBM seems to have similar demographics to that of airway-centered idiopathic fibrosis, because both groups involved similar age groups and showed a female predilection. However, in contrast to airway-centered idiopathic fibrosis and in terms of prognosis, all patients (with a mean follow-up of 2.4 years) with PBM had good prognosis with no mortality reported. PBM has been described as an incidental histologic finding without any clinical significance in a considerable proportion of lung biopsies obtained from patients with chronic interstitial lung disease. Whether PBM represents a stage in the development of airway-centered idiopathic fibrosis or an incidental finding without any significance is not yet known. No definitive factors are known to have an established role in the etiopathogenesis of airway-centered idiopathic fibrosis. Further studies with a larger number of subjects are needed to elucidate its exact cause. The condition remaining idiopathic would not be a surprise, much like other idiopathic interstitial pneumonias. Airway-centered idiopathic fibrosis is a relatively new entity, and its exact incidence and prevalence are not known. Three case series have described 10, 12, and 68 patients, respectively. [1, 3, 4] A few others describe 1-2 case reports of this entity. Airway-centered idiopathic fibrosis has also been described under several names, such as idiopathic bronchiolocentric interstitial pneumonia, centrilobular fibrosis, and peribronchiolar metaplasia. As noted earlier, this condition is more common in females (the male-to-female ratio is 2:1) and involves a wide age range (23-69 years), with a mean age of 46 years. It has been described in white, black, and Asian patients. Most patients with airway-centered idiopathic fibrosis present with respiratory symptoms. Progressive dyspnea and chronic cough are the most common symptoms. Wheezing and chest pain are uncommon presenting symptoms. Physical examination reveals bibasilar inspiratory crackles. Pulmonary function testing reveals a restrictive pattern with a decrease in total lung volumes, forced vital capacity (FVC), forced expiratory volume in 1 second (FEV1), and carbon monoxide diffusion capacity. Residual volume (RV) to total lung volume ratio and FVC to FEV1 ratio are within normal limits. Bronchioloalveolar lavage (BAL) fluid analysis does not show any specific findings, but there may be a mild increase in lymphocytes with 1-4% eosinophils. Chest radiography shows bibasilar reticular interstitial infiltrates, diffuse reticulonodular infiltrates that are predominant in central zones, thickening of bronchial walls, and small central ring shadows. High-resolution computed tomography (HRCT) scanning demonstrates peribronchovascular interstitial thickening and traction bronchiectasis with thickened airway walls and surrounding fibrosis. Conglomerate fibrotic masses adjacent to the central airways may be present. Bronchiolectasis and honeycombing are less commonly seen features. Rarely, ground glass attenuation may be noted. A bronchiolocentric pattern of lung injury can be seen in a wide variety of conditions, such as rheumatologic/connective tissue disorders, pneumoconiosis, and the chronic stage of hypersensitivity pneumonitis. Chronic aspiration should also be considered. [8, 9] It is important to obtain an extensive clinical history for any exposure to allergens, antigens, occupational agents, and drugs, as well as any history of connective tissue disorders, before a patient can be diagnosed with idiopathic airway-centered interstitial fibrosis. Perform laboratory testing to rule out autoantibodies. Important conditions to consider in the differential diagnosis of airway-centered interstitial fibrosis on histology are hypersensitivity pneumonitis, respiratory bronchiolitis-interstitial lung disease, nonspecific interstitial pneumonia (NSIP), and usual interstitial pneumonia. Hypersensitivity pneumonitis classically shows a triad of bronchiolocentric interstitial pneumonitis with poorly formed granulomas, cellular bronchiolitis, and interstitial chronic inflammatory infiltrate. However, this triad is seen in only 60-80% of the cases. Clinically, the patients are characterized by a history of exposure to antigens and the presence of serum antibodies against the allergen. The characteristic features on imaging are centriacinar nodules and ground glass attenuation, which is a rare and focal finding in airway-centered interstitial fibrosis. On histology, airway-centered interstitial fibrosis shows more extensive fibrosis and less inflammation compared with hypersensitivity pneumonitis. Differentiating between these two conditions is important because the hypersensitivity pneumonitis has a much better prognosis. Respiratory bronchiolitis-interstitial lung disease (RB-ILD) shows a bronchiolocentric pattern with a predominance of pigment-laden macrophages within the bronchiolar lumen and in the surrounding alveolar spaces. In contrast, airway-centered interstitial fibrosis shows minimal amount of pigmented macrophages in the bronchiolar lumina and alveolar spaces. Imaging studies reveal bilateral ground glass opacities. RB-ILD hasa more favorable prognosis compared with that of airway-centered interstitial fibrosis, and it responds to smoking cessation in most cases. Steroids are required only in refractory RB-ILD cases. Obliterative bronchiolitis may show some overlapping features with airway-centered interstitial fibrosis as bronchiolar wall fibrosis and lumen narrowing may be seen. However, obliterative bronchiolitis differs from airway-centered interstitial fibrosis in the extent of the fibrosis and the involvement of interstitium. In early stages of obliterative bronchiolitis, the bronchioles show concentric mural fibrosis with lumen narrowing. Organizing granulation tissue may be seen within the bronchiolar lumina in some cases. In late stages of obliterative bronchiolitis, the lumen is completely obliterated due to progressive fibrosis, and the interstitial septa show minimal and focal involvement. Clinically, patients with obliterative bronchiolitis demonstrate an obstructive pattern on pulmonary function testing. Imaging studies show nonspecific features such as hyperinflation. This condition invariably has a progressive course with a poor prognosis. Airway-centered interstitial fibrosis may look similar to the fibrosing pattern of NSIP due to the temporally homogeneous linear fibrosis. However, in NSIP, relative sparing of the bronchiolocentric areas with a predominant involvement of the interstitium is seen. Distinguishing this entity from airway-centered interstitial fibrosis is importlant, as NSIP has a better prognosis. The pattern of usual interstitial pneumonia is characterized by four histologic features, temporal heterogeneity, fibrogenic foci, interstitial fibrosis with honeycomb change, and a subpleural location with predominant involvement of the peripheral parts of the lobules. In contrast, airway-centered interstitial fibrosis features a predominant centrilobular involvement with absent fibrogenic foci. Temporal heterogeneity and honeycomb changes are not seen in airway-centered interstitial fibrosis. Very limited data are available on the gross findings of airway-centered interstitial fibrosis. Gross findings in an explant lung from a patient who was diagnosed with a disorder similar to airway-centered interstitial fibrosis revealed small lungs with a smooth pleural surface and peribronchovascular and peribronchiolovascular bundle fibrous thickening that was more evident in the lower lobes. The upper and middle lobes demonstrated diffuse fibrosis, but no honeycomb change was noted. As the name indicates, airway-centered interstitial fibrosis is an airway-centered disease with predominant centrilobular involvement in a secondary lobule. Lung wedge biopsy specimens show a patchy distribution with a dominant bronchiolocentric pattern of involvement on low-power examination (see the image below). The bronchiolar walls are thickened with distortion of the lumina. Airway-centered idiopathic fibrosis (ACIF). Low-power view showing predominant centrilobular fibrosis located around bronchioles and vessels with sparing of the peripheral part of the lobule. On high power, the bronchioles show peribronchiolar subepithelial or adventitial fibrosis with none to mild mononuclear inflammatory cell infiltrate (see the image below). Airway-centered idiopathic fibrosis (ACIF). Bronchiolar wall showing fibrosis and smooth-muscle hyperplasia. The bronchiolar lining epithelium is intact. The smooth muscle in the wall of the bronchioles and vessels may show hyperplasia. The adjoining fibrotic alveolar walls may show bronchiolar metaplasia. The bronchiolar lumen and alveolar spaces contain a minimal amount of alveolar macrophages. The subpleural and peripheral lobular space is relatively spared by the fibrosis and inflammation. Architectural remodeling is absent. Microscopic honeycomb change is rare but can be seen. The bronchiolar lumen or alveolar spaces do not show any organizing tissue polyps. Significant inflammation is generally absent and fibrogenic foci are absent. 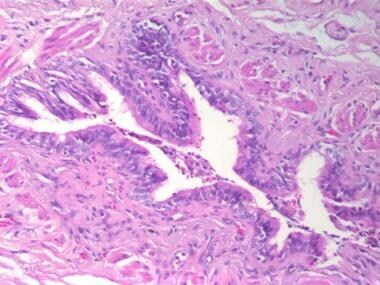 The interstitium does not show any granulomatous inflammation. 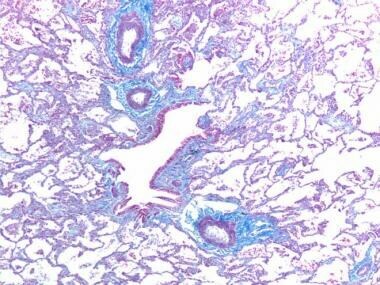 Masson trichrome stain (see the image below) can be used to highlight the bronchiolocentric pattern of fibrosis of airway-centered interstitial fibrosis. Airway-centered idiopathic fibrosis (ACIF). Collagen staining highlighting the peribronchiolar and perivascular fibrosis with relative sparing of the surrounding interalveolar septa. None of the histologic features has been found to be helpful in predicting the prognosis. However, in one study, the patients who died of disease had severe pulmonary involvement at the time of diagnosis. Managing the underlying cause of airway-centered interstitial fibrosis, and steroids are the mainstay of the treatment. Lung transplantation is required in patients with progressive disease that does not respond to steroids. Kuranishi LT, Leslie KO, Ferreira RG, et al. Airway-centered interstitial fibrosis: etiology, clinical findings and prognosis. Respir Res. 2015 May 9. 16:55. [Medline]. Virk RK, Fraire AE. Interstitial lung diseases that are difficult to classify: a review of bronchiolocentric interstitial lung disease. Arch Pathol Lab Med. 2015 Aug. 139 (8):984-8. [Medline]. Yousem SA, Dacic S. Idiopathic bronchiolocentric interstitial pneumonia. Mod Pathol. 2002 Nov. 15 (11):1148-53. [Medline]. Churg A, Myers J, Suarez T, Gaxiola M, Estrada A, Mejia M, et al. Airway-centered interstitial fibrosis: a distinct form of aggressive diffuse lung disease. Am J Surg Pathol. 2004 Jan. 28 (1):62-8. [Medline]. Fenton ME, Cockcroft DW, Wright JL, Churg A. Hypersensitivity pneumonitis as a cause of airway-centered interstitial fibrosis. Ann Allergy Asthma Immunol. 2007 Nov. 99 (5):465-6. [Medline]. de Carvalho ME, Kairalla RA, Capelozzi VL, Deheinzelin D, do Nascimento Saldiva PH, de Carvalho CR. 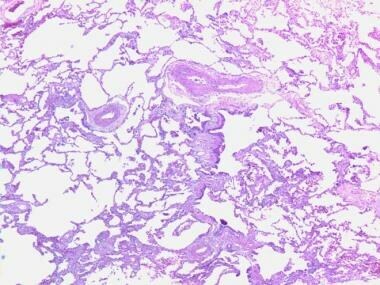 Centrilobular fibrosis: a novel histological pattern of idiopathic interstitial pneumonia. Pathol Res Pract. 2002. 198 (9):577-83. [Medline]. Fukuoka J, Franks TJ, Colby TV, et al. Peribronchiolar metaplasia: a common histologic lesion in diffuse lung disease and a rare cause of interstitial lung disease: clinicopathologic features of 15 cases. Am J Surg Pathol. 2005 Jul. 29 (7):948-54. [Medline]. Smith ML. Update on pulmonary fibrosis: not all fibrosis is created equally. Arch Pathol Lab Med. 2016 Mar. 140 (3):221-9. [Medline]. Bois MC, Hu X, Ryu JH, Yi ES. Could prominent airway-centered fibroblast foci in lung biopsies predict underlying chronic microaspiration in idiopathic pulmonary fibrosis patients?. Hum Pathol. 2016 Jul. 53:1-7. [Medline]. Salvatore M, Smith ML. Cross sectional imaging of pulmonary fibrosis translating pathology into radiology. Clin Imaging. 2018 Sep - Oct. 51:332-6. [Medline]. Colombat M, Groussard O, Taille C, et al. Lung transplantation in a patient with airway-centered fibrosis. Am J Surg Pathol. 2004 Nov. 28 (11):1540-2. [Medline]. Yi XH, Chu HQ, Cheng XM, Luo BF, Li HP. Idiopathic airway-centered interstitial fibrosis: report of two cases. Chin Med J (Engl). 2007 May 5. 120 (9):847-50. [Medline]. Pradere P, Gauvain C, Danel C, et al. Airway-centered fibroelastosis: a distinct entity. Chest. 2016 Mar. 149 (3):767-74. [Medline]. Kronborg-White S, Ravaglia C, Dubini A, et al. Cryobiopsies are diagnostic in pleuroparenchymal and airway-centered fibroelastosis. Respir Res. 2018 Jul 13. 19 (1):135. [Medline].